The artwork of D.R. Laird brings back wonderful memories of softly falling snow and preparing the ice for the neighborhood hockey game. 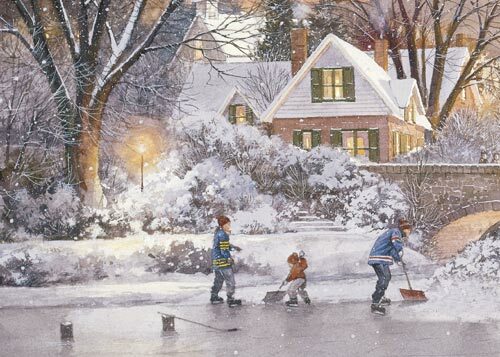 'Shoveling Ice' is the perfect title to the artwork that is featured on this beautiful holiday card. Each box of cards contains 25 cards and 25 envelopes printed on high quality heavy card stock. This design is available with a blank interior or you can choose to add a custom verse along with your personal message. Perfect for business or personal use.